Chocolate coconut fudge cups – This chocolate coconut fudge cups only made for Christmas treat!!! 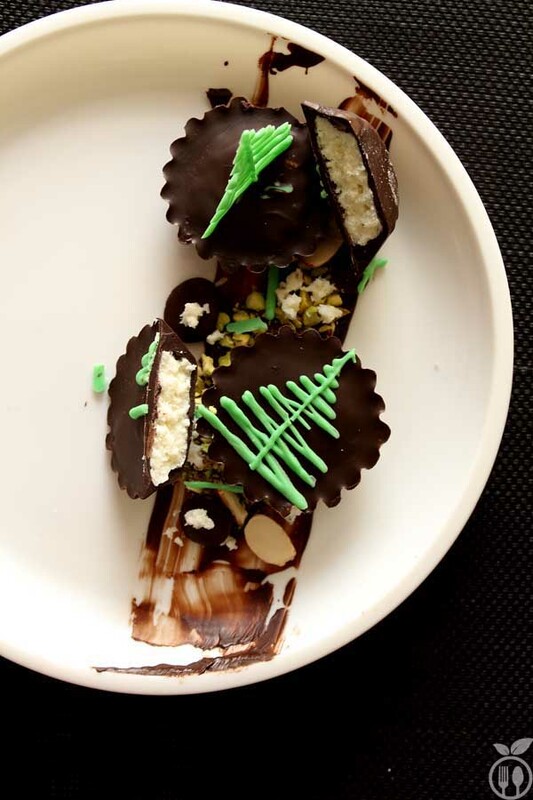 Christmas has always meant Chocolates and cakes… On Christmas, my family used to go to my favourite Thomas uncle’s house and always get some unique chocolates and new innovative homemade cakes. It was only reason, I loved Christmas! 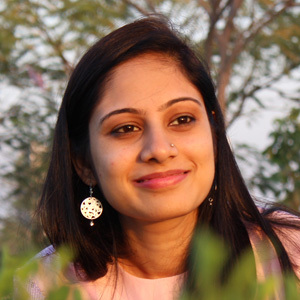 As a kid, I loved to give chocolates to friends on my Birthday, I almost checked out 4-5 chocolate stores to find out unique and delicious chocolate for my birthday every year! My father always helps me to get it. NOW, I made my own chocolates, not for my birthday, but for my family member’s birthday and for every location. 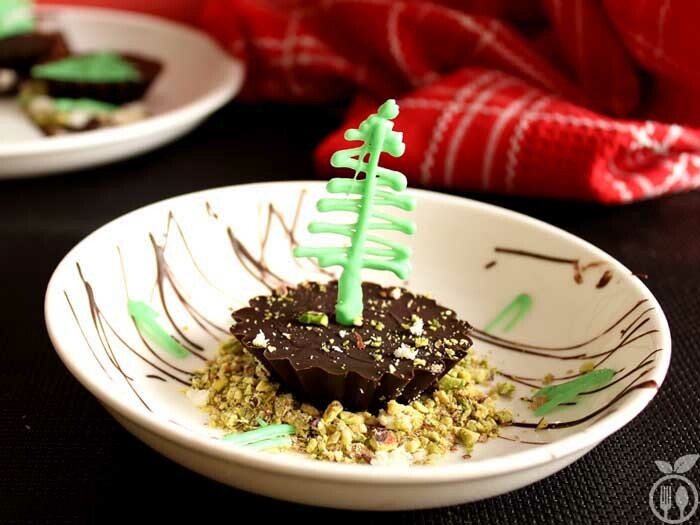 These chocolate coconuts fudge cups also for birthday and treat for everyone in this Christmas…. This is easy and fun making activity. 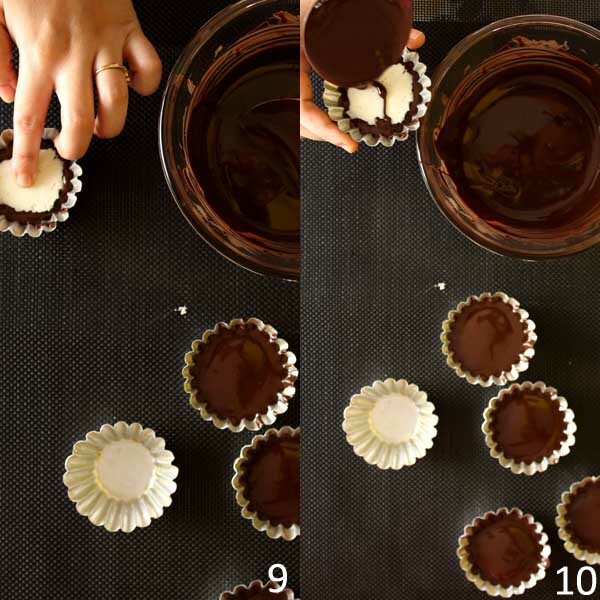 You can enjoy every steps of making this chocolate coconut fudge cups. To give little Christmas touch, I have made Christmas tree decoration from white chocolate. 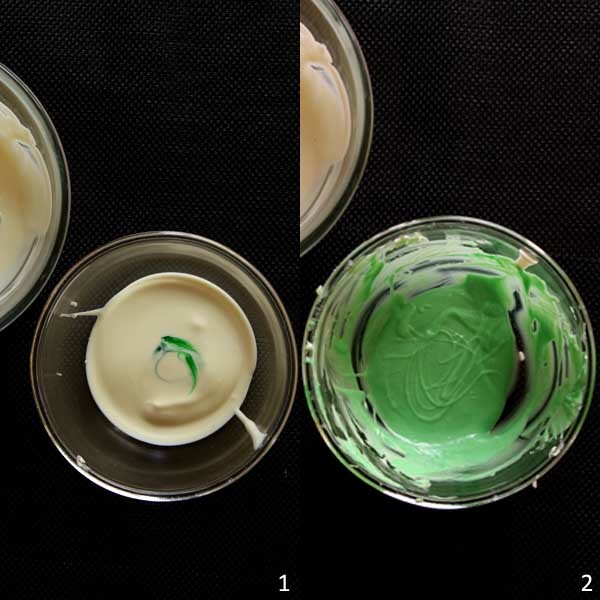 Use some drops of green food colour into melted white chocolate, and pour them into piping bag. Now the fun activity is begun. Create tree like structure using this green colored white chocolate, and you can any shape like tree. Let it cool. Then, add white chocolate into shredded coconut, and mix it quickly. Then give shape as big as you like bigger chocolate. And let it cool. 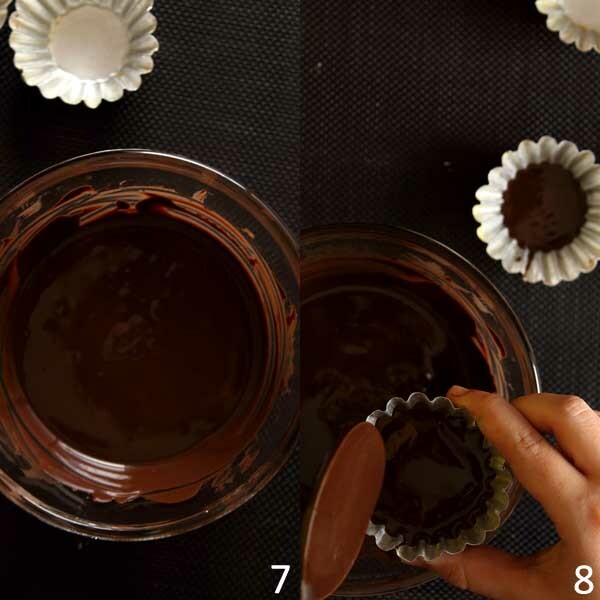 Last and easy step: melt the dark chocolate, you can use milk chocolate as well. Take cupcake mold, add 1 tbsp dark chocolate, then put that coconut and white chcolate piece into it and again cover with dark chocolate. Then, put that tree shape at top of chocolate either in standing position or just lay down. Both looks lovely. If you try this recipe, let us know! Give comments and also rate this recipe. 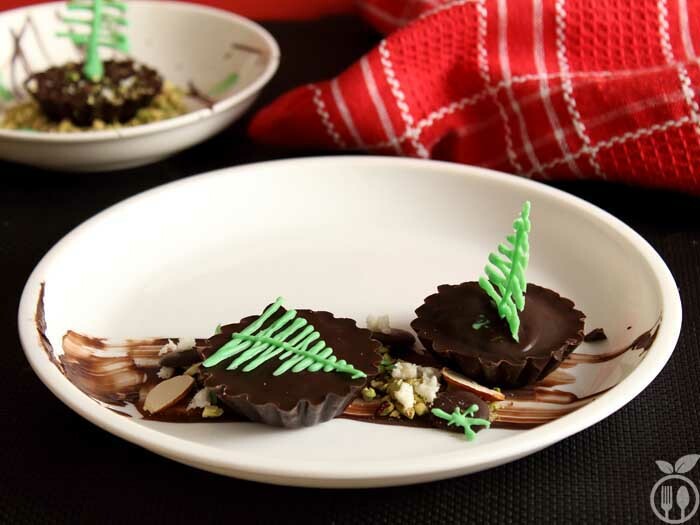 Merry Christmas and enjoy this chocolate coconut fudge cups, friends. While adding food colour into white chocolate, first add half amount of food colour, mix it well, if you want more green, then add more. 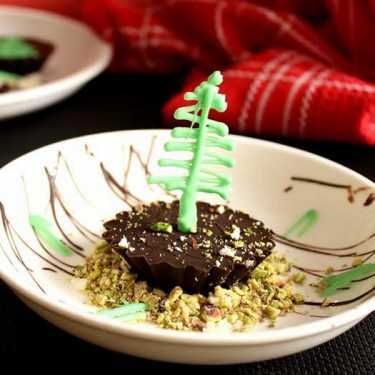 Once your green coloured white chocolate is ready, immediately pour it into piping bag, and give a shape, otherwise chocolate become harder, and you cannot give shape as you like. You can also give heart shape or star shape by adding different food colours. I have used dark chocolate. You can use any, but use bitter chocolates to cover the coconut and white chocolate combo. Otherwise your chocolate tastes too sweet. 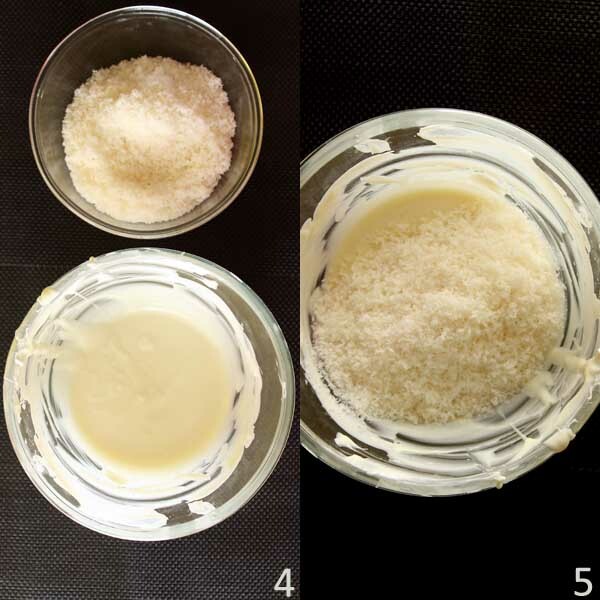 Melt the white chocolate by using double boiler method or into the microwave. Then take ⅓ portion of melted chocolate into separate bowl. And add 8-10 drops of green food color. 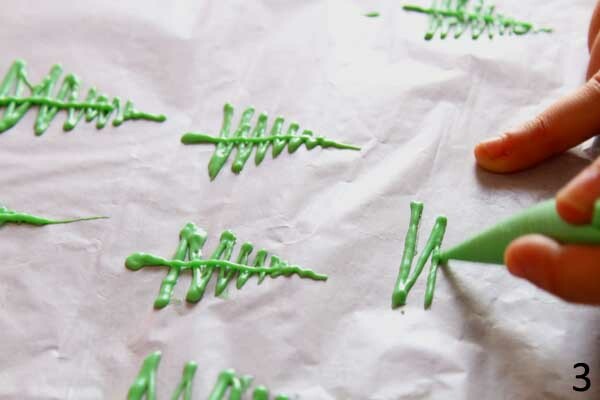 Take green white chocolate mixture into piping bag, and give shape of Christmas tree or any other shape you like. Let it cool into freezer for 10 minutes. 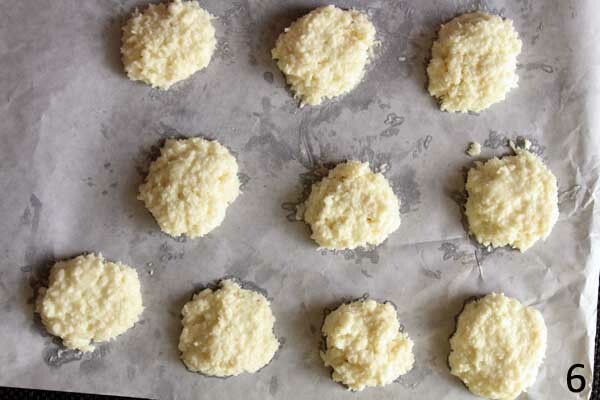 Now, add shredded coconut into remaining ⅔ of white chocolate, and mix it well. Then on butter paper, make pieces of this mixture. Around 10 pieces you can make from this quantity. Let it cool into fridge for 10 minutes. Now melt dark chocolate by using boiler method or into the microwave. Take cup cake mold, add 1 tbsp of dark chocolate, and put the white chocolate coconut piece and again cover it with dark chocolate. Then put tree shape on that cups either in straight standing position or lay down onto this cup tops. You can also use create shapes like stars or heats. Let it cool into fridge for 5-10 minutes and your chocolate coconut fudge cups are ready. 1) You can store it for 2 weeks into airtight container at room temperature or into fridge. 2) Serve as desserts at party meals.